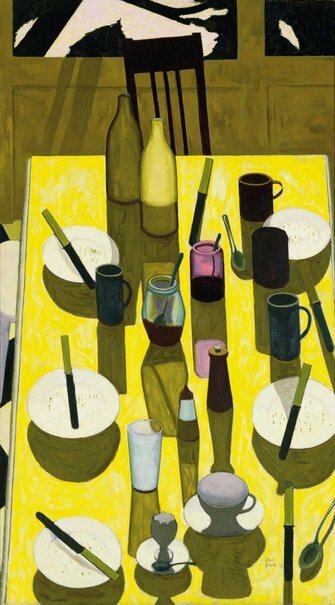 'The breakfast table' by John Brack depicts the traces of a family's morning meal before the cutlery and plates have been cleared away. It captures a simple moment of domesticity, breaking with the pictorial and thematic conventions of the still-life genre. The painting suggests the interactions and traits of the sitters invisible to us. Empty glasses, cups and mugs remain on the table surrounded by plates with scattered crumbs, bottles, knives and jars of fruit conserve. Brack's palette is arresting: the illuminated, almost fluorescent yellow of the table top contrasts the deep shadows cast by the items on it. He has arranged the objects in an almost geometric pattern, so that objects sit in relation to one another and are intrinsic to the success of the overall composition. Signed and dated l.r., dark green oil "John/ Brack 58". Michael Brand, Look , 'From the Gallery director', pg. 11, Sydney, Sep 2013, 11. John Cruthers, Important Australian art from the collection of Reg Grundy AC OBE and Joy Chambers-Grundy , 'Introduction', pg. 10-11, Sydney, 2013, 11, 152, 153 (colour illus. ), 154. lot no. 45; estimated price $500,000-700,000. Kirsty Grant, John Brack , 'Human nature: the art of John Brack', pg. 87-136, Melbourne, 2009, 106. Lisa-Marie Murphy, Look , 'Building the Gallery's collection', pg. 33-34, Sydney, Mar 2015, 33 (colour illus.). Lara Nicholls, In a new light: the art collection of Trinity College, The University of Melbourne , 'The beginnings of a collection', pg. 10-11, Parkville, 2001, 11. Katrina Strickland, The Australian Financial Review , 'Public galleries go for Grundys', pg. 3, Melbourne, 29 Jun 2013-30 Jun 2013, 3. Art Gallery of New South Wales Foundation: Celebrating 30 years of art acquisitions , Sydney, 2015, 40 (colour illus.). Wayne Tunnicliffe, Look , 'John Brack: two superb new acquisitions', pg. 30-31, Sydney, Dec 2013-Jan 2014, 30, 31 (colour illus. ).